Hesperia Ciutat De Mallorca Majorca Mallorca Hotel in Palma de Mallorca. This Hotel Accommodation by the beach in Majorca Mallorca on the Coast of Spain, has a swimming pool, is close to the beach. Prices from 44.5 EUR. 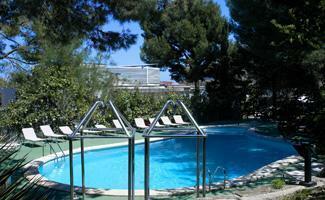 Welcome to the Hesperia Ciutat De Mallorca Majorca Mallorca Hotel.Set in attractive gardens, Hesperia Ciutat de Mallorca has an outdoor swimming pool,a sun terrace and gym. Each air-conditioned room includes a balcony, satellite TV and free Wi-Fi. For more on this Hotel Accommodation by the beach in Majorca Mallorca on the Coast of Spain please click on the availability buttons above and below. The Hesperia Ciutat De Mallorca provides excellent Hotel Accommodation in Palma de Mallorca, Majorca Mallorca, on the Coast of Spain. The address is Francisco Vidal Sureda 24, Palma de Mallorca, 7015.